As Thanksgiving approaches, Filta Environmental Kitchen Solutions offers advice to turkey lovers as they prepare to deep-fry their Thanksgiving day turkey. ...don't burn yourself or your house down." Deep frying a turkey can be messy, expensive and dangerous. Filta, the company that invented fryer management offers tips to stay safe this Thanksgiving... and to keep the house from burning to the ground. There are numerous videos on YouTube, DIY on Pinterest and plenty of tips on the web for deep frying a turkey for a Thanksgiving feast. "Unfortunately, most of them miss a few critical safety tips that we have learned servicing commercial deep fryers to make sure you do not burn yourself or your house down." according to Tom Dunn, Filta's COO. No more than 10-12 Pounds Max – Consider just using the breast. If the bird is too big, the oil will spill over the pot and create a burn and fire hazard. Also, if the bird to too heavy, getting it out will be a challenge. Remove the neck and giblets from the body cavity. If using a whole bird, remove the wire or plastic truss that holds the legs in place. Cut off the wing tips up to the first joint and cut off the tail. 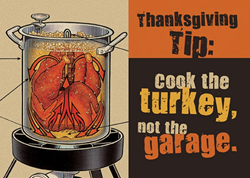 Do not stuff a turkey to be deep fried. Injected marinades are fine into the meatiest parts of the bird, but do not inject the marinade just under the skin as a water-based marinade will result in the hot oil popping and splattering. Stay at least 10 feet away from a house, garage, deck or other structure. Place the fryer on level ground. If it is going to rain or snow – skip turkey frying for this year. Wear oil resistant and heat resistant gloves, an apron and safety goggles. Oil is going to splatter. It is not worth going blind while cooking a turkey. Always be ready to put out a grease fire. Do not use water on a grease fire. Covering the fire and choking out the oxygen source is an option, but have an ABC fire extinguisher ready, just in case. Type of Oil: Peanut Oil – great flavor, and a higher smoke point. Many people miss this step. Many turkey fryers feature a “fill line” indicating the suitable level of oil to add to the pot, but if that feature is absent from your fryer, or you wish to prevent an overflow, determine the amount of oil required for your pot, put your turkey in the empty pot and then fill with water slightly above the top of the bird. Remove the turkey and then note the water level, using a ruler to measure the distance from the top of the pot to the surface of the water. Dump the water and dry the pot and the bird thoroughly. Refill the pot with oil to the level you determined. 350 degrees. Cooking at less than 350 degrees will cause the bird to absorb excess oil and taste greasy. Cooking temperatures over 350 degrees will cause the bird to be burned on the outside and raw in the middle. Use a good quality oil thermometer with a long stem clipped on the side of the pot. The bird must be dry and completely thawed. Remove the pop-up timer from the breast (if applicable). Turn off the burner. Using a good quality poultry rack, insert the bird vertically onto the rack. Then, using the supplied hook, lower the bird slowly into the oil. If excess splatter occurs, gently lift up and then slowly submerge the bird back into the oil. Once fully submerged, place the hook aside. Cooking Time: Approx. 3 minutes per pound. Do not leave a fryer unattended at any time.